Mat is an up and coming artist from Oregon who released his first major label album in early 2006. Nothing Left to Lose, which is also the name of his first single, has done fairly well thus far. He did a summer tour with John Mayer and Sheryl Crow and is currently doing a few shows with fairly big acts like the Goo Goo Dolls, Lifehouse, O.A.R., Sister Hazel, Smash Mouth, Gin Blossoms, and Five for Fighting before he meets up with John Mayer again this winter. His future looks very promising as his fan base is continually growing and his rap style lyrics mesh well with his smooth melodies. I got a chance to see him live in concert about a month ago and he put on a good show. He played all the songs from his new album plus a Johnny Cash song with Griffin House at the end. He sounded exactly the same as he does on the recordings and played both the guitar and piano. In a small venue and Griffin House opening up for him, it was a good time. 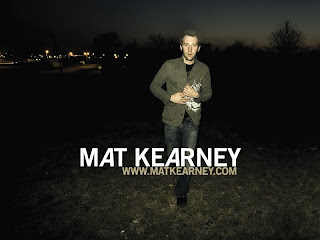 I discovered Mat Kearney when I was experiencing insomnia late one night last summer. I flipped on VH1 and Mat Kearney's video for the single "Nothing Left to Lose" was playing. When I first heard his voice it sounded very similar to the Lead Singer of Coldplay, Chris Martin. When I went on to Rhapsody to check out his album, I found that he also did a little rapping in some of his songs. That voice seemed to be very similar to the singer from Fort Minor and Linkin Park, Mike Shinoda. After those connections were made, I began to listen to the album more and more. I listened to the album in its entirety about 5 times the day after seeing the video. This is one of those great albums that you don't feel the need to skip over some songs and can just listen to the whole thing without feeling anxious about changing the song. I feel like I need to highlight a few of the songs because they should not be overlooked. You can listen to the album in its entirety at at his official website, where there is a player in the top right corner of the page. Besides the obvious pick, "Nothing Left to Lose", the songs, "Undeniable", "Wait", "Bullet", "Girl America", and most recently "Renaissance" are my favorites. "Undeniable" is a great song with rap style verses and a great chorus, the first song of his new album. "Wait" is probably my favorite song off the album, a very mellow song with a great message. "Bullet" has some great lyrics, proclaiming, "It doesn't matter if they call me wrong / Doesn't matter if they steal my song / Doesn't matter if we're all along / It doesn't matter at all / Cause I would take a bullet for you". "Girl America" has a touch of religion embedded in it and carries a good social message. "Renaissance" is a song that grows on me every time I hear it. It is a very powerful song that just continues to build up and has a great chorus. This is a great album and I highly recommend it. I give it 5 stars, two thumbs up, 10/10, it surely won't disappoint. Thanks for listening, go check it out.